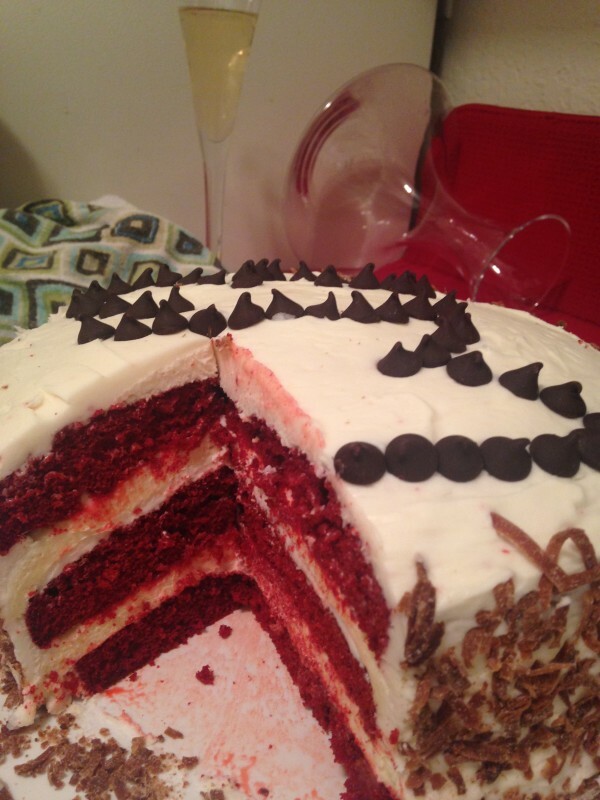 The first time I had the red velvet cheesecake was at our friend Jen’s baby shower. Her favorite is the ULTIMATE RED VELVET CAKE CHEESECAKE you can find at The Cheesecake Factory. I took one bite and instantly grabbed my camera to take a photo. I wanted to remind myself that this was one cake I needed to add to my bucket list. April 8, 2015 would be our dear friend Emily’s birthday. I asked her husband what she would want me to bake. 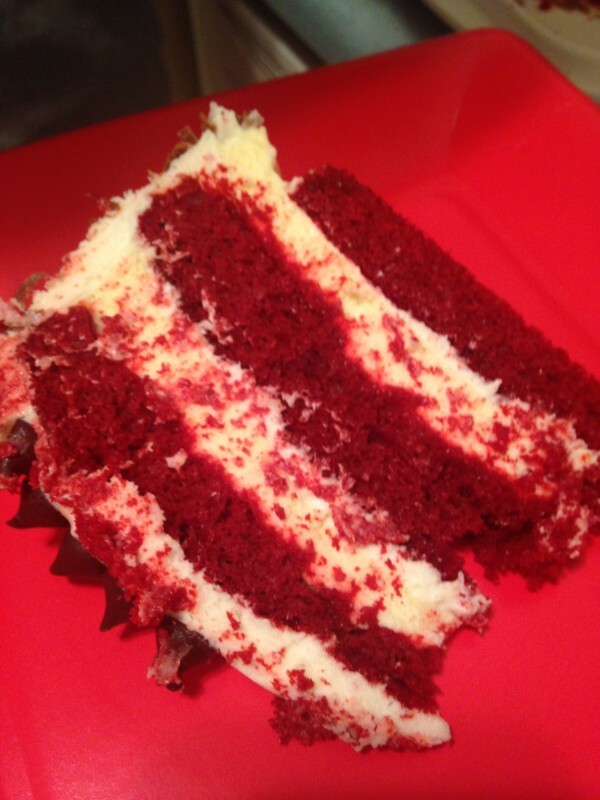 He came up with red velvet cupcakes with cream cheese frosting. 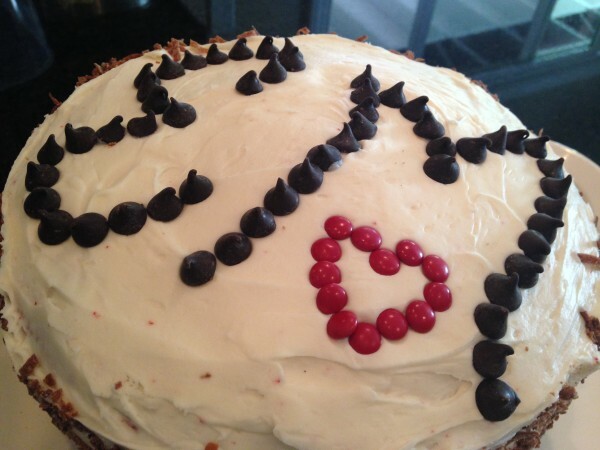 From that moment I was on a mission to make her my own version of the red velvet cheesecake I enjoyed months earlier. 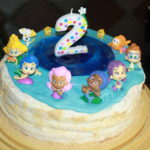 The best part about this cake is the fact that you can do it over a course of 3 days. You don’t need to do everything at one time. The first day you can make your cream cheese frosting and keep it in the fridge until ready to use. 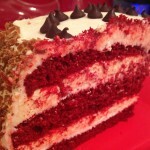 The second day, you can make your three layers of red velvet cake and freeze them until ready to use. The third day, you can make your two cheesecakes and then assemble everything. You can make your red velvet cake from scratch or you can use the box cake. Either way, have fun with this. It is well worth the time! Use PAM and spray two springform pans. In the bowl of an electric mixer, beat the cream cheese on low speed for 1 minute until smooth and free of any lumps. Add the eggs, 1 at a time, and continue to beat slowly until combined. Gradually add sugar and beat until creamy, for 1 to 2 minutes. 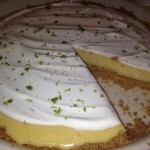 Add sour cream, lemon zest, and vanilla. Periodically scrape down the sides of the bowl and the beaters. The batter should be well-mixed but not overbeaten. Pour the filling evenly into each springform pan. Cut the recipe in half so they are even. *** You don’t have to use a water bath. I do this so that the cheesecake doesn’t get too hard. You also don’t need 2 springform pans. If you only have one, then bake them separately or bake one large on and cut it half horizontally. Straight across. Not up and down. Set the cheesecake pans on a large piece of aluminum foil and fold up the sides around it. Place the cake pans in a large roasting pan or baking dish. Pour boiling water into the roasting pan until the water is about halfway up the sides of the cheesecake pan; the foil will keep the water from seeping into the cheesecake. Bake for 35-45 minutes. The cheesecake should still jiggle (it will firm up after chilling), so be careful not to overcook. Let cool in pan for 30 minutes. Chill in the refrigerator, loosely covered, for at least 4 hours. Loosen the cheesecake from the sides of the pan by running a thin metal spatula around the inside rim. Cut 7 inch circles out of parchment paper, spray each cake round pan with PAM Baking spray and then lay the parchment circles inside each pan. Spray the top of the parchment paper again with the baking spray. This will help the cake fall right out. In a large bowl, cream together the canola oil, sugar, and eggs. Slowly add in the food coloring bottle to this bowl and then fill the bottle with cold water and add the water from the food coloring bottle to the bowl. You can also buy another bottle of food coloring but it will save you money to do it this way and you get the same red velvet color. Add in the cocoa and blend all together. Add the salt and buttermilk to the large bowl and mix. Next add these one at a time and cream together each time before adding the next item: flour, vanilla, white vinegar, and baking soda in that order. 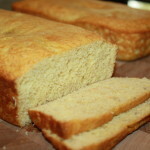 You will use about 1 and ¾ cup of batter in each cake round. Giving you a total of about 2 and ¼ cup of batter. You can make two or three tiers. I always think 3 looks better than two. You can even do more tiers with less batter in each. Bake for 20-23 minutes for the 3 cakes. Mine took a total of 23 minutes. As you see the sides begin to get a little brown they are ready to come out. Don’t overcook as you want the cake to stay nice and moist. Let the cakes completely cool out of the oven. You can cover with foil and store in freezer or use right away. Once they are room temperature you can mix up your cream cheese frosting. Waldorf Astoria uses a custard-like frosting. 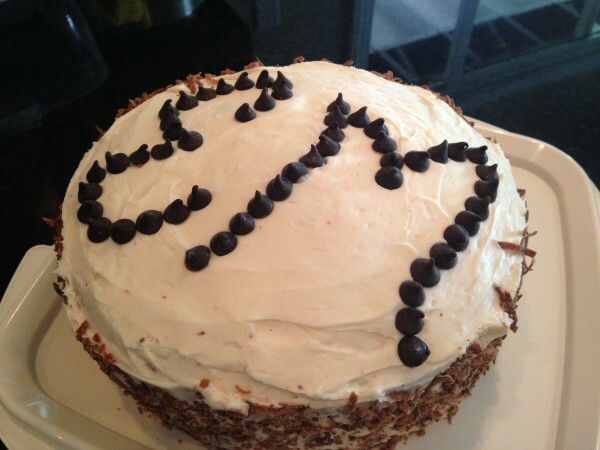 I always go with a cream cheese frosting for red velvet. In a very large bowl, use a hand mixer to blend all 4 ingredients together. Combine butter, cream cheese, powdered sugar, and vanilla until smooth and creamy. One large plate or cake stand. 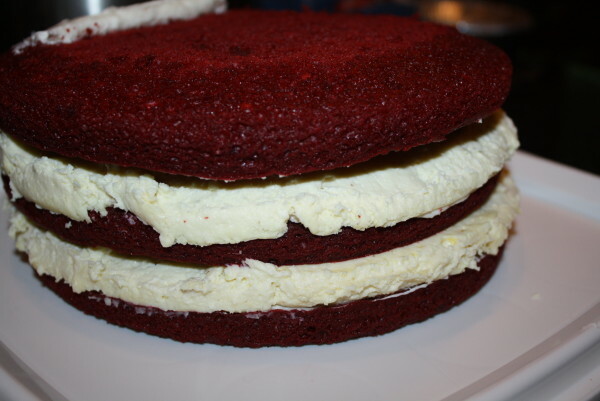 Lay one layer of the red velvet cake down with the top of the cake facing down towards the plate. Using a cake spatula spread about 1/4 of cream cheese frosting on the top of that cake and then add one layer of cheesecake. Be very careful placing the cheesecake. Gentle! 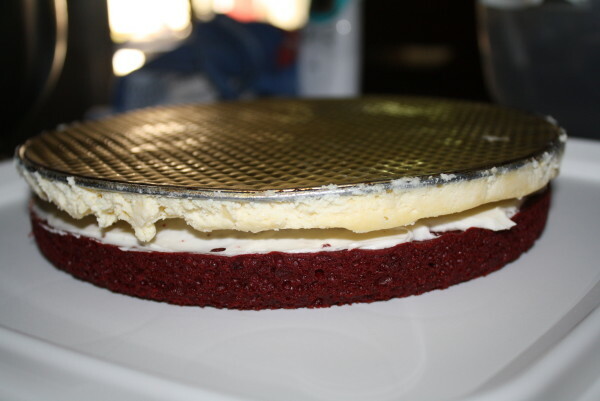 Lay one cheesecake on top of the first red velvet layer. 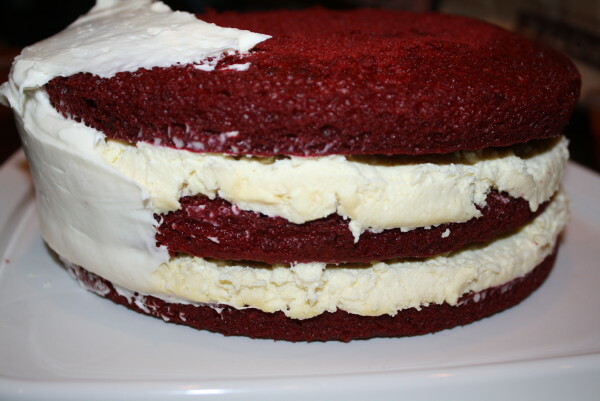 Add your second red velvet layer. Using a cake spatula spread about 1/4 of cream cheese frosting on the top of that cake and then add the last layer of cheesecake. 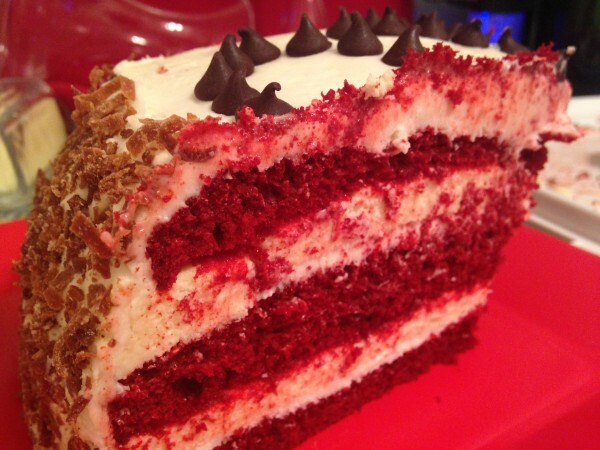 Add your last layer of red velvet cake. Use the remainder of the cream cheese frosting by spreading it along the sides covering all the red of the cake so you only see the frosting. You can save a tablespoon or so, of frosting in case you make a boo-boo. To decorate your cake, I love the traditional toasted coconut. It just gives it a simple and elegant look. 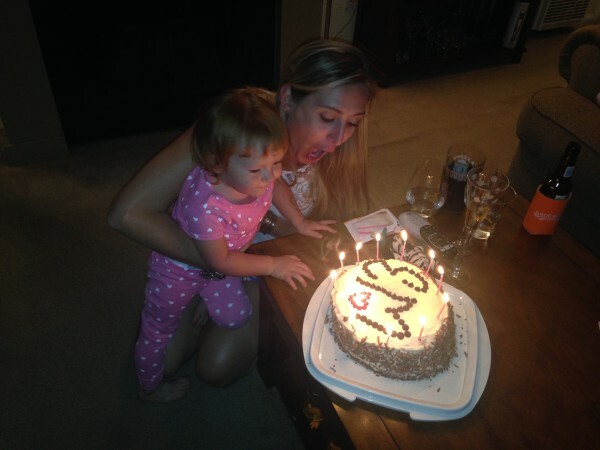 Place one small candle in the center or many around the edges for birthday celebrations. Feel free to use chocolate chips to write out a name. 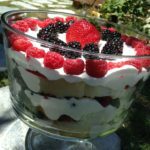 Once your cake is complete, put it in an airtight container and store in the fridge for 24 hours. I put a large bowl over the top of my cake and use saran wrap to seal up the cracks so no air gets in. On a small baking sheet covered with foil, bake on 350 for 7-10 minutes stirring every couple minutes until browned. Add to the top of the cake, the bottom and/or the sides. Completely optional. You can even leave the toasted coconut in a bowl for guests to top their slice of cake themselves. 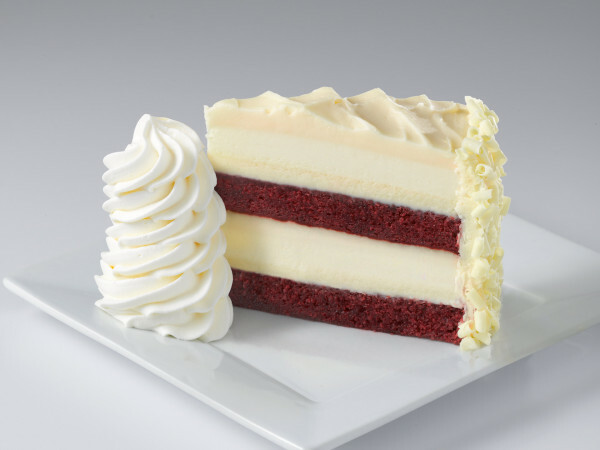 You must visit The Cheesecake Factory for this amazing cake!